Here's a quick catch-up before you watch the new season premiere on Saturday, 15 October, 8am on Disney XD (Astro Ch 617 & 637), with 5 things you need to know and a handy timeline to keep you on track! 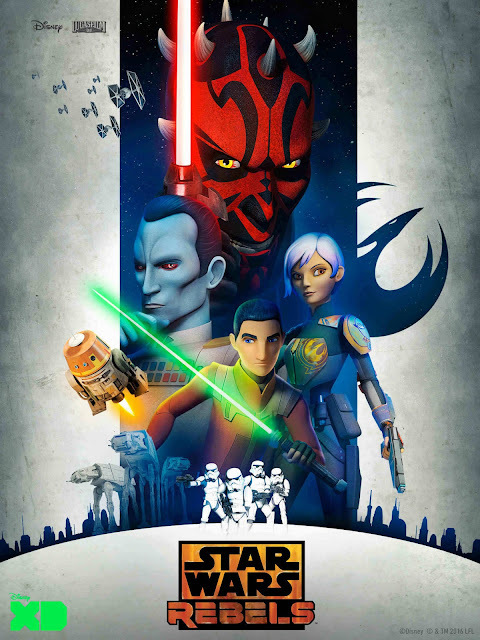 Star Wars Rebels – the animated series by Lucasfilm Animation on Disney XD, covers the events that take place fourteen years after Star Wars: Episode III - Revenge of the Sith and five years before Star Wars: Episode IV - A New Hope. At this time, the Galactic Empire is securing its control on the galaxy, while the last of the Jedi Knights are being tracked down by Darth Vader's Imperial army. However, hope remains as the fledgling Rebel force takes form against the Empire. Before you pop any popcorn and wield your lightsaber, get ready for a BRAND NEW Season of Star Wars Rebels by first catching up on the full Star Wars saga as shown in the movies and on Disney XD! 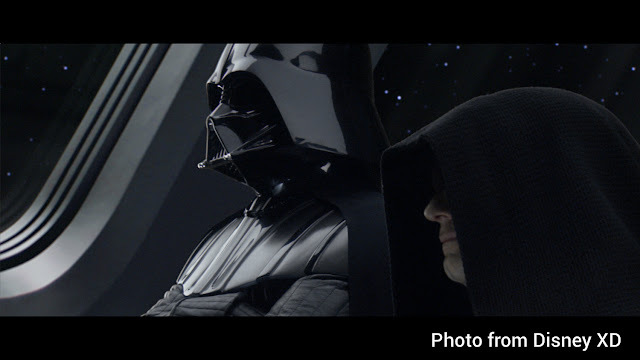 A trade dispute, sparked by an illegal blockade to the planet Naboo by the Trade Federation, is revealed to be a plot by Darth Sidious. With Queen Amidala of Naboo held hostage, Jedi Master Qui-Gon Jinn and his Padawan Obi-Wan Kenobi attempt a daring rescue. 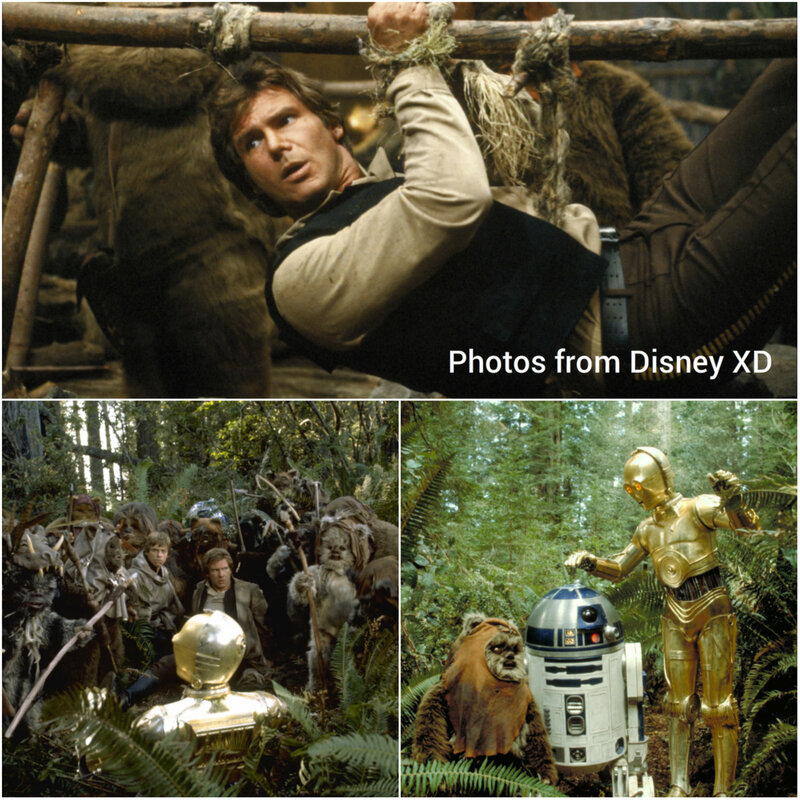 Along the way, they encounter a young slave named Anakin Skywalker who later begins Jedi training. Ten years on, Obi-Wan is a general; with Anakin at his side, they help to defend the Galactic Republic from attacks led by former Jedi Master Count Dooku. 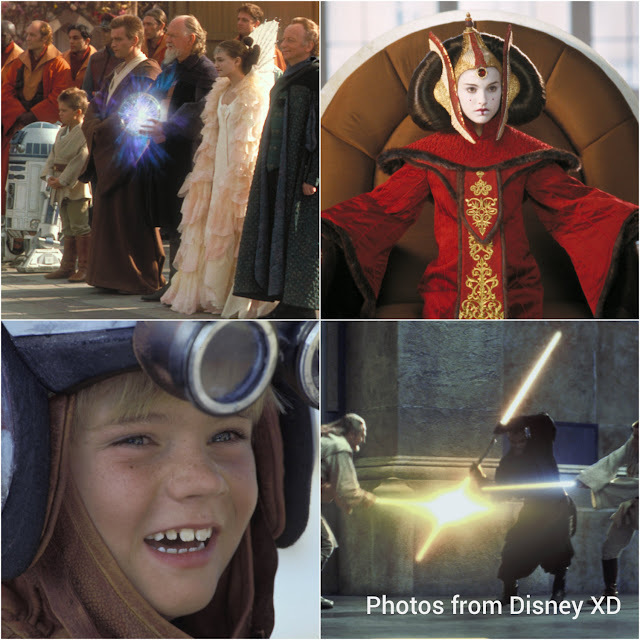 Anakin is assigned to protect the influential senator Padmé Amidala; their romance leads to a secret wedding. Meanwhile, Dooku delivers the Death Star blueprints to his Sith master, Darth Sidious, marking the beginning of the Clone wars. Chancellor Palpatine's power and influence grows as the Clone Wars progresses, as well as suspicion among the Jedi Council regarding the Chancellor's allegiance. Anakin is then asked to spy on the chancellor but the Council's refusal to grant him the rank of Jedi Master leads to resentment. Anakin soon embraces the Dark Side, fuelled by bitterness and manipulated by the fear of losing his wife Padmé, who, unknown to him, gives birth to twins. 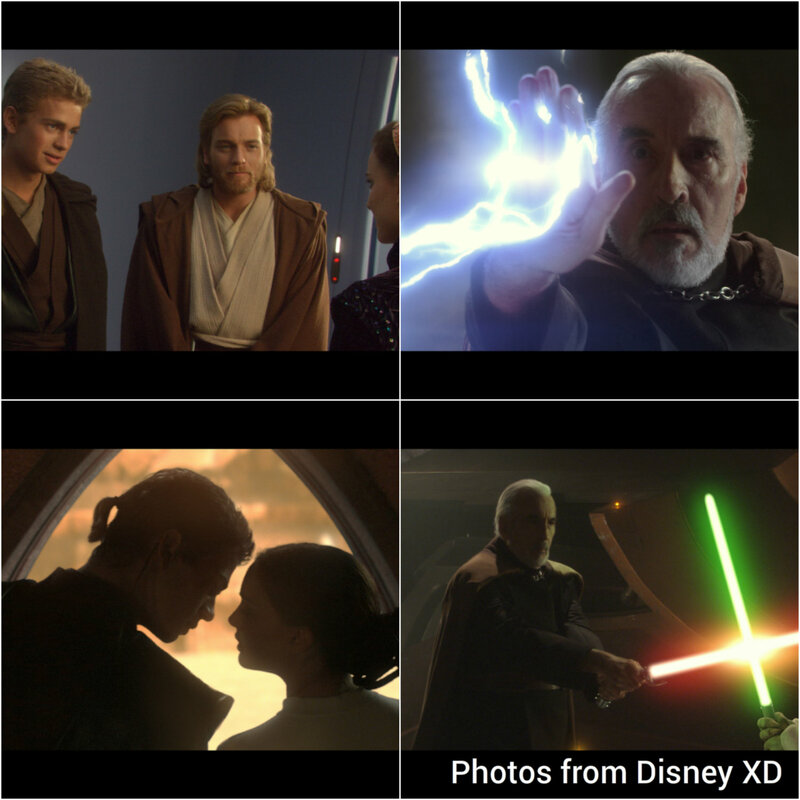 A confrontation between Anakin and Obi-Wan leads to serious injuries; Darth Sidious saves his life, marking the 'birth' of the Sith Lord Darth Vader. Fourteen years later, a young orphan named Ezra meets the captain of a ship called Ghost, Hera Syndulla, and her motley crew – Sabine Wren, Zeb Orrelios, Chopper the droid, and Kanan Jarrus who is an undercover Jedi. Together they traverse planet Lothal and the surrounding Outer Rim, learning about the growing rebellion and their role in resisting the Imperial army while Ezra is trained in the ways of The Force by Kanan. The Rebels are adjusting to their new missions within a larger Rebellion taking place on planets like Garel and Lasat. They receive a call for help from Minister Maketh Tua, who convinces the Rebels to help her defect from the Galactic Empire in exchange for vital Imperial secrets. They return to Lothal only to find it under Imperial siege and soon have their first encounter with the Dark Lord of the Sith, Darth Vader. Having established a secret base on planet Atollon, the Ghost crew, now led by a more powerful Ezra, strengthens the rebel fleet by acquiring new resources and recruits eager to stand against the Empire. However, Imperial efforts to eliminate the rebellion are now being led by the cold and analytical Grand Admiral Thrawn, whose strategic, tactical and cultural insights make him a threat unlike any they have ever faced before. Ezra and Sabine have to take on new roles and challenges as the rebels prepare for their biggest mission yet – a direct assault on the Empire. 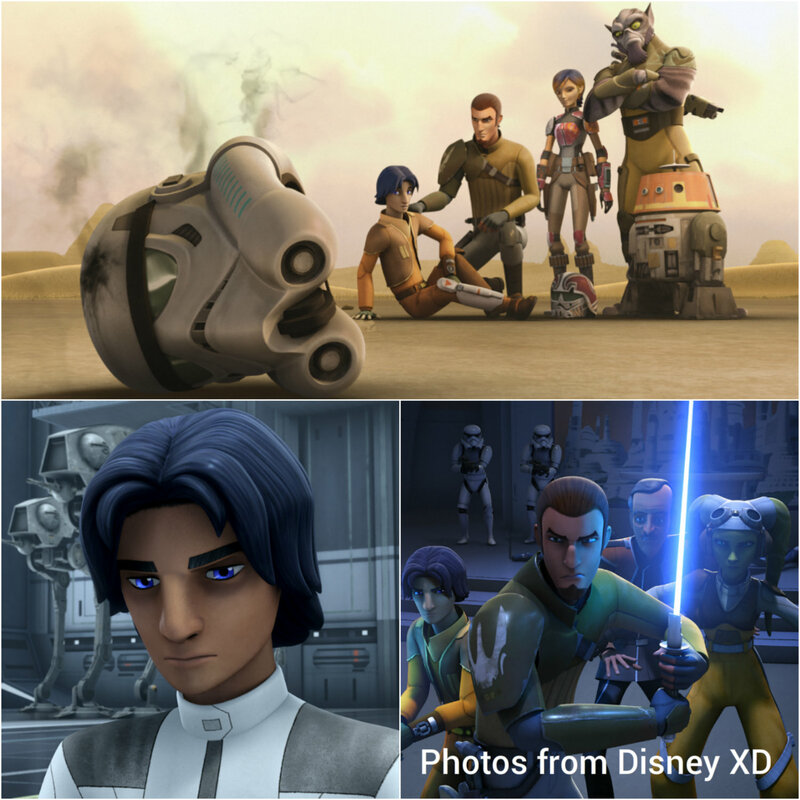 The Rebels started with Ezra Bridger, Hera Syndulla, Sabine Wren, Zeb Orrelios, Chopper the droid, and Kanan Jarrus. They met and began their mission against the Galactic Empire on a planet called Lothal, traveling on a ship known as the Ghost, as shown on Season 1. While the Rebels gear up for their biggest battle against the Empire in Season 3, the battle within Ezra rages on as he's torn between the light and dark side of the Force. The last episode of Season 2 showed him opening the Sith holocron that powered the Sith temple – something that can only be performed by someone who thinks like a Sith. Darth Maul is back since he was last seen in Star Wars: Episode 1 - The Phantom Menace, with an appearance in Star Wars: The Clone Wars TV series. This time, his personal agenda to gain power continues in the third season of Star Wars Rebels, as he's made it clear he's neither with the Rebels nor with the Empire. 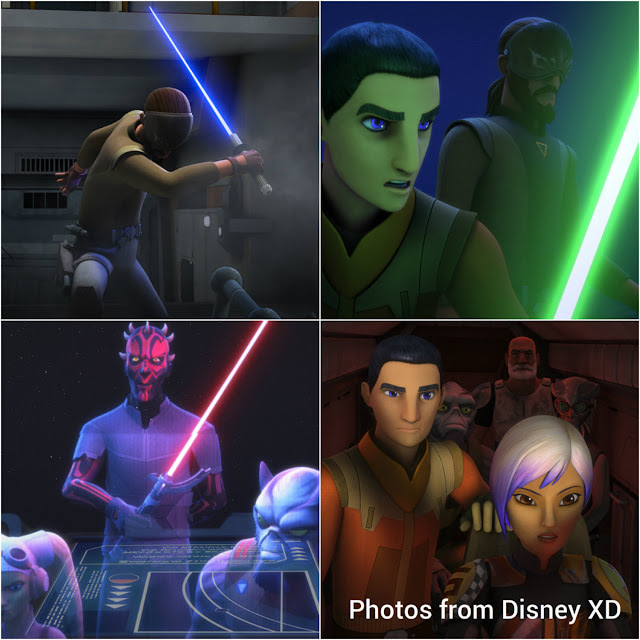 After being blinded by Darth Maul's lightsaber in the season finale of Season 2, Kanan Jarrus now sports a beard and wears a black mask. The experience has changed his perspective on life and he is made to rely more on the Force as a guide. In Season 3, the Imperial army is now led by the cold and analytical Grand Admiral Thrawn, who's strategic, tactical and cultural insights make him a threat unlike any the Rebels have ever faced before. Meanwhile, Kanan Jarrus will meet a Force-sensitive ancient being on planet Atollon called Bendu, who claims to represent the center of the Force. Thirty-two years after Episode III - The Revenge of The Sith, Princess Leia leads the Rebel Alliance, hiding the Death Star blueprints in the astromech droid R2-D2 before being captured by Darth Vader. 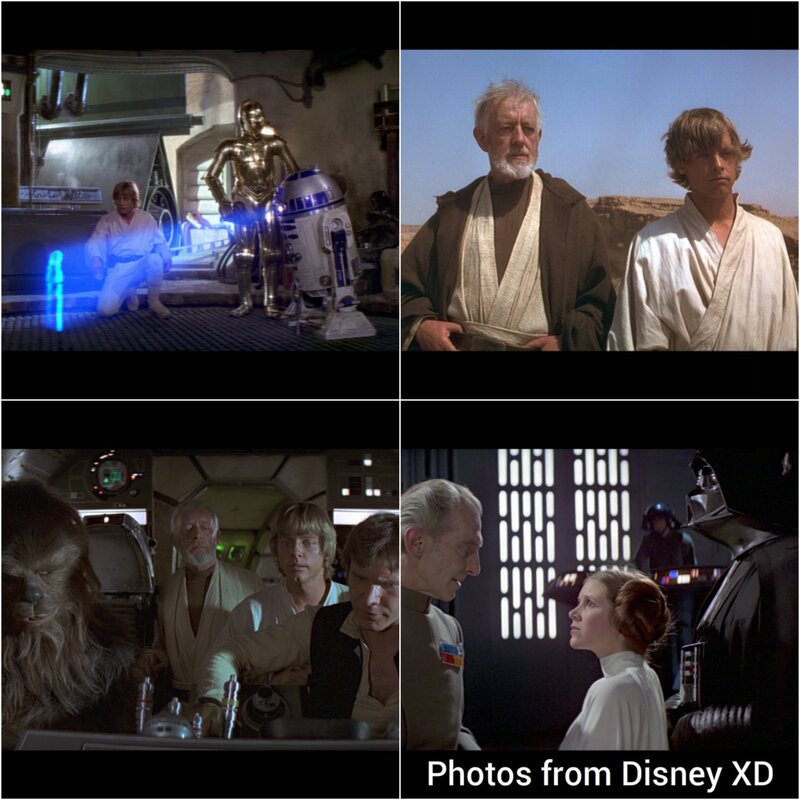 An adopted farmhand Luke Skywalker discovers the droid on Tatooine and embarks on a mission with Obi-Wan Kenobi to deliver the plans to the Rebels, hiring smuggler Han Solo and his ship the Millennium Falcon. The Rebels then identify a weakness in the Death Star, planning a successful assault and destroying the Death Star. Three years after the Death Star is destroyed, Darth Vader pursues Luke Skywalker and the Rebel Alliance base on the ice planet Hoth. Luke studies the Force under Jedi Master Yoda but leaves to rescue Han Solo and Leia when they are captured by Vader. 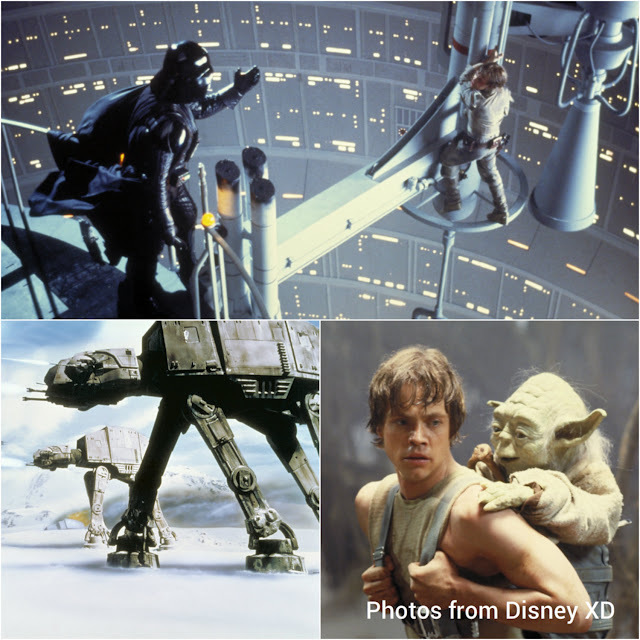 Luke then faces Vader, loses his hand and discovers that Vader is his father. Meanwhile, Han has been frozen in carbonite and surrendered to the bounty hunter Boba Fett, to be delivered to Jabba the Hutt. Luke and Leia, assisted by local Chewbacca and Lando Calrissian, rescue Han Solo from Jabba the Hutt while the Galactic Empire constructs a second Death Star in order to crush the Rebel Alliance once and for all. The Rebel Fleet launches a full-scale attack on the Death Star while Luke struggles to bring his father, Darth Vader, back from the Dark Side of the Force. In the fight, Vader chooses to save his son, killing the Emperor and dying from his wounds, bringing an end to the Empire's hold over the galaxy. Thirty years after the destruction of the second Death Star, the First Order rises from the fallen Galactic Empire with an even greater weapon – the Starkiller. Opposing them is the Resistance, led by General Leia who also searches for her brother Luke. Meanwhile a scavenger named Rey – who shows an ability to use the Force - encounters BB-8, a droid which holds a vital clue to Luke's location, and is taken captive. Former Stormtrooper Finn, Han Solo and Chewbacca attempt a rescue, with Han confronting his son, Kylo Ren, leader of the First Order. 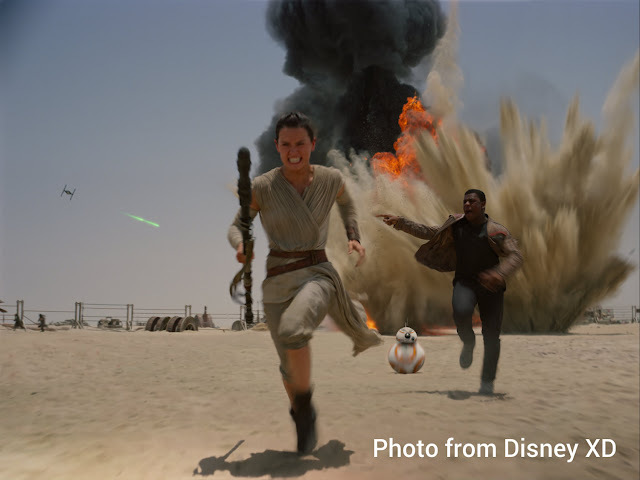 Han is killed and the Starkiller Base is destroyed; soon after, Rey follows the map hidden on BB-8 and R2-D2 to Luke's location on planet Ahch-To. 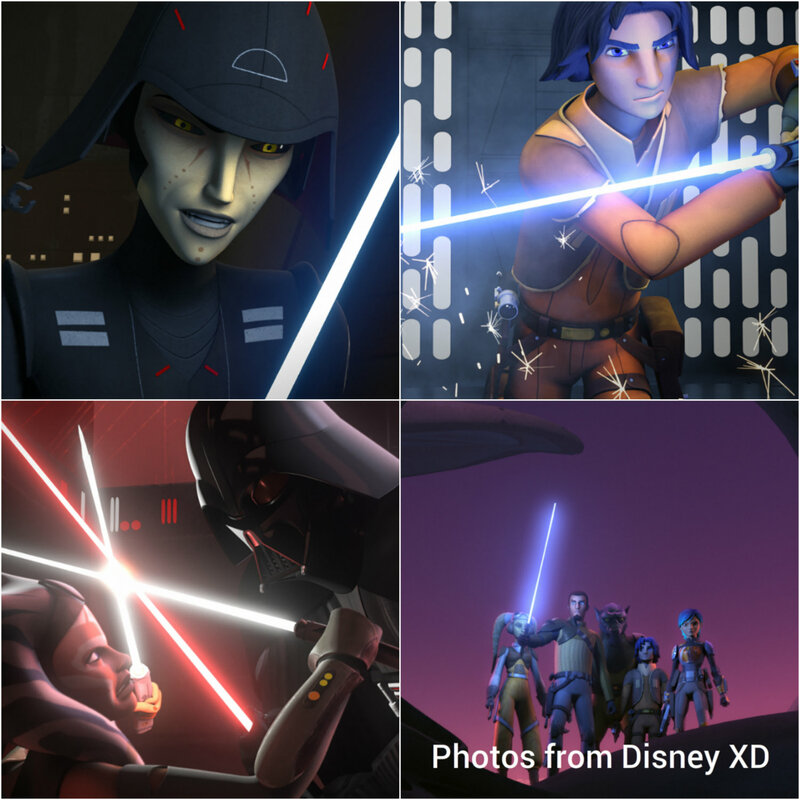 Now that you're all prepared, don't miss the premiere of STAR WARS REBELS Season 3 this Saturday, 15 October, 8am on Disney XD (Astro Ch 617 & 637)!